Description and Definition of Bows and Arrows. Bows and arrows are weapons made of a strip of wood, or other flexible material such as bone or horn, with a cord connecting the two ends, by means of which an arrow is propelled. The bow is basically a form of spring powered by a string or cord. Arrows were the missiles shot from bows which were made from a straight thin shaft and usually feathered and barbed. An Arrowhead was the blade or point that was made of bone or stone, and later metal, and hafted to an arrow. Arrowhead points were smaller than Spear points and penetrated the skin more deeply than when fired by a bow. Native Indians learned how to make bows and arrows, which, like making all types of weapons, was a time consuming task. One bow could take over one month to make. Many Native Americans would adopt their own identifiable style and length of arrow as an aid in recognizing them. Many carried a measure with them indicating the exact length of their arrows. Others used the arrowheads as a form of identification or a specific feather design. This enabled them to determine who had killed a given animal and claim the quarry. 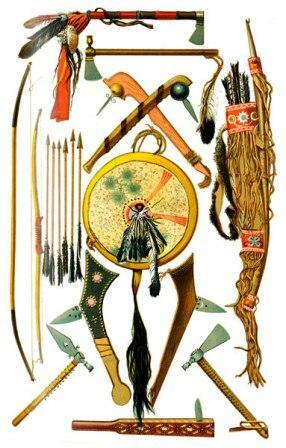 Bows and Arrows are the most famous weapons of Native American Indians and were used for hunting and fighting. Bows and Arrows provided long range, accurate weapons and the opportunity to shoot rapid shots on foot or on horseback. Different types and sizes of bows and arrows were designed for hunting and for fighting. Bows were commonly fired from horseback for war and hunting purposes. Bows for horseback riders were smaller than those used on foot to allow for maximum manoeuvrability. The training required by Native Indians to use bows and arrows was extremely time consuming - it was necessary for them to become expert marksmen and they developed their skills in the use of bows and arrows as children. The arrows were carried in Quivers made of leather, bark, wood, furs and other natural materials which was slung across their back. Animals such as foxes, coyotes and beavers were also used in making quivers. Quick release of arrows was essential. Native Americans were able to make one shot every 3-4 seconds at a range of about 200 yards. Bows and Arrows - Poisoned Arrows? Did Native American Indians use poisoned arrows? Yes! Please refer to Poisoned Arrow for facts and information about how these deadly weapons were made and the venom and poison that was used by Native Americans. Bows and Arrows were made using the natural resources and raw materials available to the Native Americans. A tough, hard wood was required to make the bows that included ash, hickory, juniper, oak, Osage orange, cedar, walnut and birch. Other Indians chose to use horns or antlers to make bows or the bones of large animals, especially the bow-shaped bones from the rib cage. Bowstrings were made of animal gut, sinew or rawhide. Plant fibers were also used for drawstrings including nettles, dogbane, milkweed, and dogbane or the inner bark of basswood or yukka. Arrows were made from raw materials from reeds or shoots, such as dogwood, ash, birch and chokecherry. The chief skill of Native American men lay in making weapons. They whittled bows from tough wood or bone and shaped them into a curve. They made arrows with a sharp stone head and lashed feathers to the arrow to make it fly straight. The art of making efficient weapons with bows and arrows required element to be balanced in proportion to the others. Arrowheads were the projectile points added to bows which were made in a number of different shapes.